Music -- What is the musical quality of this album? Freaking awesome -- How many freaking awesome songs are on this album? Memory -- Was there something that ingrained this album into your being in your past? Wild-card -- Just as it reads. Drugs, suicidal tendencies, more drugs, fighting, 18 hour studio sessions, in-band romances, more drugs. This was the story of the Smashing Pumpkins in the early 90's. Following their debut release of Gish, the Pumpkins were elevated to a status in the realm of Nirvana in the alternative music scene. I never gravitated towards Nirvana like many of my peers. I was craving a different sound, and the Pumpkins on Siamese Dream grabbed me immediately. Music -- Dreamy? Electric? How do I describe this music? Unconventional vocals. Unconventional guitars. Drastic rhythm and melody changes in songs that drift off into la-la land. Sound effects never heard before on any previous albums. If this sounds like I'm describing the latest album of Nicki Minaj, you're correct. 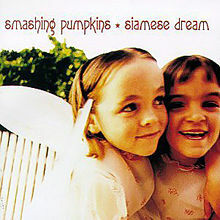 But, it also describes the music on Siamese Dream. I find it interesting that Billy Corgan doesn't have a powerful or strong voice. He almost sounds timid at times, but his airy/scratchy voice is the perfect complement for this type of music. Freaking awesome -- When I hear the Cherub Rock drum/guitar into, my blood starts pumping more than when I take a regular dose of Viagra. This album is SO good. Nary a letdown throughout. Today is strong, but the heavy radio play killed the buzz for me. So many fantastic songs: Hummer, Rocket, Disarm, Soma, Mayonaise, Luna....holy crap, I think I just had a music-gasm. Memory -- 1993 was my freshman year at college. I lived in the dorms with a fun bunch of guys. It was the first time I ever had cable...and thus, MTV. Countless hours were "wasted" in front of the TV watching the same videos over...and over...and over again. This was how I was introduced to the Pumpkins. --The Smashing Pumpkins CD on constant repeat in my sweet 3-disc CD changer. --2 room-mates who had a feverish addiction to Jimmy Buffet. Despite my initial misgivings, I am now a parrot-head. --Listening to more country music than I'd care to admit...as most of the videos on CMT were a limitless plethora of sweet looking honeys. Wild-card -- The Pumpkins are horrible live. Absolutely horrible. It's amazing what recording in studio can do for the sound quality and tone of a band or singer. Please do not go see them live. You'll think you're at a Nicki Minaj concert. This is a fall from the top for my one-time favorite band. At one point in time, this was considered to be my favorite album in the world. I know every word of every song. I've listened to this album literally hundreds of times. This is one of the only bands on my list where I have met the members. I gravitated to this 3-man ensemble and was mesmerized by Folds' amazing piano work. While possibly considered "alternative", there are strong Jazz and southern rock influences. This album was literally recorded in a house, and it sounds like it. No amazing studio producer touches here. Just raw talent and great music. This sound only enhances the uniqueness of this album. Music -- Ben Folds is sick disgusting on the piano. Listening to him on the album is only part of the show. You really have to see him live, or on YouTube to appreciate what he does. He plays complex music flawlessly, while singing lead vocals, leading his band, and putting on a show. He plays mostly with one knee on a stool, and half-standing up in order to reach the pedals. If you play the piano, you'll appreciate his extreme level of skill and genius. In addition, his schoolboy vocals are a perfect complement for this type of music. By only incorporating bass, drums, and the piano, there is some limit to the type of music which can be played, but they get 100% out of it. Freaking awesome -- Smoke is one of my favorite songs in the entire world. Definitely top 5. I never tire of hearing this song. Selfless, Cold, and Composed is also one of my favorites. Fair, Brick, Evaporated, and Battle of who could care less also highlight this amazing album. Every song is good. Memory -- I have seen this band live more than once, but nothing can top seeing them in a small club in Salt Lake City. There was less than 300 people, and we secured spots standing right against the stage in the center, literally 5 feet from the band. I had never been so close to a band playing live, and the fact that it was my favorite band made it even more impressive. This memory is buoyed by the fact that my date that night ended up as my wife. The roofy I slipped in her drink was the start of something great between us. Wild-card -- When the band broke up, I was devastated. Devastated! Luckily, Ben Folds continued his solo career, and his first album was decent. Since then, he has become a glorified wedding singer. His edgy, smart tunes are gone in exchange for ballads meant for his kids and wife. BUT!!!! 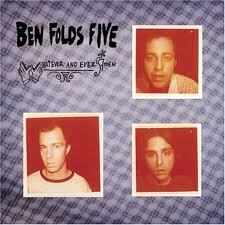 !-----Ben Folds Five has announced one reunion album with all new material. They are literally "getting the band back together." I can barely contain my enthusiasm. I'm solidly in the Generation X profile. Generation Y bands were not my cup of tea. Green Day? Blink 182? What was this new-fangled punk rock that my gangly little brother listened to? How horrible was the Ska phase? Swing music? Do they still put on a Vans Warped tour? Do they still sell Vans? 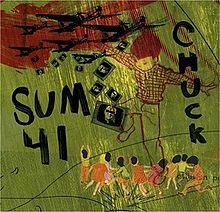 But....there was one shining star to come out of this spilled milk phase of American culture--Sum41. I can hear the giggling now, but this is because you have never really listened to them. Music -- I believe this is some of the best guitar and rhythm work being created in the rock arena today. You'll hear a strong influence of Metallica. Sum41 can play in a song at a frenzied pace, only to halt the speed into a slow, harmonic bridge. The net result is a band that I think creates some of the best music in the industry. Am I out of their demographic? Hell yes. Can I enjoy their creative genius all the same? Yes...just don't tell my little (still gangly) brother. Freaking awesome -- This album holds one of my coveted "top 10 songs of all-time" in We're all to Blame. I love this anthem. 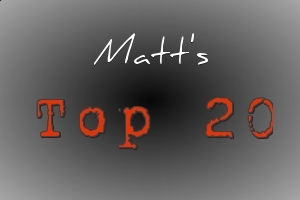 I'm not the One lands a spot in my top20 songs of all-time. Additionally, there is a Golden Corral-size buffet of other rock favorites to enjoy. In fact, the only song that is just average is Welcome to Hell. I'd say no less than 4 songs from this album would be in my top 50 of all-time. Memory -- This is hands down the best album to listen to while doing strenuous exercise. Unfortunately, I only exercise strenuously 3 times a year. 1. Once when I decide to "start running" in March, and then promptly wheeze my way through 2 miles. From this point on, running gets placed into cold storage. 2. The second is at the start of Church basketball when I attempt to re-live my glory days on the hardwood. After shooting 2-16 and pulling a hammy, I shut down my inner Michael Jordan. 3. The last is when I get my fat gut out of the water on a water-ski. I fall into a glorious pillar of water after only 6 shaky turns as my arms strength is roughly equivalent to most 8th grade girls. BUT....if you intend on committing your body to exercise more than me, you should listen to this album while sweating. It'll keep you going on those lonely miles. 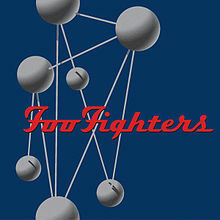 If you hadn't noticed, I'm kind of a big Muse and Foo Fighters fan with both bands placing multiple albums in my top 25. I honestly think that Dave Grohl is the most talented musician in the world today. This album is one of the reasons why. He basically wrote everything on it. Drums, guitar, vocals, words, bass. Sick. The only bad thing I can say about this album is the way they spell color. Music -- The Foo Fighters are obviously guitar-heavy, but it's not just a steady stream of riffs and noise. The notes and melodies are catchy. I think the drum work is extraordinary as well. The Foo's can mix it up with amazing slow ballads as well. Grohl has an amazing voice, and the band complements him well. Freaking awesome -- If there was ever one song that I sing along with no matter where I am, it is Everlong. In fact, I believe this is my favorite song. I have yet to find a song with the staying power of Everlong. I love the slow build to the Crescendo in the last round of the chorus. Amazing. Other 5-star songs on the album are Up in Arms, My Hero, February Stars, New way home, and Walking after you. Upon writing this, I am considering moving this up to #1 as the album is so good. Memory -- I saw the Foo Fighters in concert with the Red Hot Chili Peppers. While the Peppers were great, Dave Grohl stole the show. His stage presence, sound quality and overall show were hands down better than Kiedis and the boys. If I could choose one person to go on a "celebrity lunch" with, it would be Grohl. Do I have a man-crush? Definitely. Wild-card -- As my age progresses, my musical taste is evolving. I see myself migrating away from the "heavier" bands of my youth towards more mellow fare. Luckily, the Foo Fighters keep me grounded in my roots. I know (spirit voice) that the Foo Fighters rock. 1997 was a great year for music. Just look at my top 5. Wow! 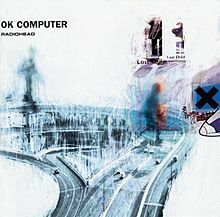 I own every Radiohead album, but I don't even like every Radiohead album. Their recent music sounds like someone took unusual sounds heard on the NY subway, and played them at random times. Then they took this noise, and introduced dropped cymbals, partially working keyboards, fuzzy mikes, and then recorded the actual album in a cavernous basketball arena. No thanks. Amazingly, there was a synchronous event in the chaos theory we call Radiohead in 1997. The disorder momentarily morphed into something so perfect...so good. I call it OK Computer. Music -- Noise. Orchestrated noise. The way that Yorke and the boys play this noise is unbelievable. Their music has more layers than Paula Deen's belly fat. Even stranger are the vocals of Thom Yorke. It's not very good. I can't even begin to imagine what their tracks sound like before the studio gets a hold of them for edits. You'd think this was a horrible album by my comments, but nothing could be further than the truth. Freaking awesome -- I highly suggest that you listen to this album in its entirety--in order. I view this album as a whole as a large rock/pop symphony. Paranoid Android is the highlight. It's a very long diverse song with multiple sounds, melodies, and beats. It is my second favorite song in the world.